An editorial cartoon in the Rupert Murdoch-owned Times of London is causing some outrage on Twitter. 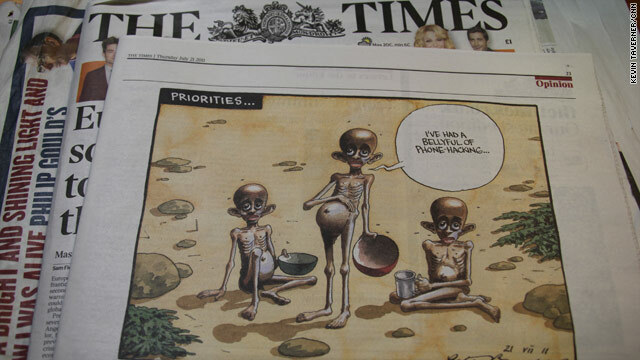 Twitter rages: Murdoch's Times of London famine cartoon 'most offensive' thing yet? If you thought the outrage over the phone-hacking scandal was starting to die down, The Times of London, one of Rupert Murdoch's own papers, may have brought it straight back into the spotlight. An editorial cartoon published Thursday morning in the paper with the title "Priorities" shows starving people in Somalia saying "We've had a bellyful of phone-hacking ... " It's causing quite a firestorm on Twitter. You can access the newspaper's site here, but you won't be able to get past the pay wall without a subscription. The paper has not yet returned calls for comment. The Guardian's Deputy Editor Katharine Viner (@KathViner) tweeted a link to a photo of the cartoon this morning and asked what people thought of it. And boy, did she get a response. From regular citizens in the U.S. and UK, to politicians, media specialists and PR folks, the responses are rolling in at a mile a minute. The responses generally fall in one of two directions: utter disgust or the notion that while the cartoon makes a point, having it come from a Murdoch-owned newspaper makes it just straight ridiculous. For some, it's being seen as an attempt to try to get readers to move away from the story and focus on something else. The cartoon does come a day after the questioning of British Prime Minister David Cameron, who has also become a part of the phone-hacking story, during which several UK lawmakers argued that perhaps it was time to move on to more pressing issues. Emma Gilbey Keller, who is married to New York Times Executive Editor Bill Keller and is a contributor to Vanity Fair Daily, had one of the most retweeted responses to the cartoon. Keller is referring to the giant public relations firm that is now working with Murdoch and his team to try to repair their damaged image after the phone-hacking scandal. There's been a lot said in the media and online about how the Murdoch empire has handled the scandal. In a post on media blog Mediaite about the cartoon, writer Alex Alvarez calls it a "tacky, potentially offensive cartoon" and says it probably isn't the right way to divert attention. "There are several methods of dealing with a much-publicized scandal, some less advisable than others. Issuing a public apology for mistakes or poor judgment? Pretty much always a good idea. Holding individuals responsible for their roles and dealing with them accordingly? Usually works out pretty well," she writes. "Publishing a tacky, potentially offensive cartoon making light of serious allegations AND life-threatening poverty? Oddly enough, that rarely ever works." She does, however, agree that more attention needs to be paid to the crisis in Somalia and elsewhere - and she's got a suggestion for what The Times of London may do to really make a statement about the issue. "We agree that eradicating childhood hunger is still a global priority and that outlets diligently, even obsessively, covering the phone hacking scandal were probably not devoting too many headlines to the plight of starving, saucer-eyed children in the first place? Although, hey. Maybe the Times of London can change the tide by donating to charities fighting to end hunger, or devoting an issue to poverty instead of offering up condescending, out of touch editorials that only work to reflect poorly on its already beleaguered employer." And there is indeed a major problem in Somalia. The president has issued an urgent appeal for international aid as his drought-stricken country faces a famine that has left half of the population in dire need. Anna Holmes, founder of the popular news blog Jezebel.com, which caters to women, acknowledged in response to someone else that she believes there's truth in the cartoon that the famine news has been buried. But she tweeted (@AnnaHolmes) "the media/public can walk and chew gum at the same time. They can talk about hacking *and* famine." Ryan Bourne, an economic and statistical researcher at the UK Centre for Policy Studies, tweeted (@RyanCPS) "I know the point The Times are getting at, but I find this cartoon very distasteful." Was it an attempt to guilt-trip readers into changing their focus? Political Scrapbook, a political blog, tweeted (@psbook) that the cartoon was an attempt to tell us to "move on," and in an post on its site, it said "the third and most tasteless prong of resistance has come from a graphic in The Times depicting children in Somalia, suggesting that talking about phone hacking has prolonged their starvation. No one is stopping The Times covering both stories." Jeff Jarvis, well-known media critic, journalism professor and creator of the BuzzMachine blog, (@jeffjarvis) simply tweeted: "Good God. Murdoch's troops no bounds" in response to Viner's search for feedback on the cartoon. Others, like Tim Karr, campaign director of the Free Press, a media reform group, called it "shameless." A lengthy search through the responses finds similar synonyms and sentiments, including that it was "brutal." One of the most retweeted comments in response to Emma Gilbey Keller's tweet was from (@TeresaKopec), who said the "Cartoon in Murdoch's London Times may be most offensive thing they've done yet." There's no doubt the comments will keep coming, and in a variety of forms, just as the tentacles of the story continue to grow and the implications of the scandal continue to murk the media waters. Let us know what you think of the cartoon and the meaning behind it in the comments section below. Let the somalis feed themselves. TO hell with them. We are all Somalian now. your a weak person if you get offended. the point of this cartoon is to try to say that the starving people in Africa is a much bigger issue than the phone hacking by Rupert Murdock. no one cares if your offended or not. The main reason racism is still here is because people keep calling attention to it and reminding everyone of the past, whether trying to prevent future racism or not. The best way to make racism go away is to just forget about it. That being said, anyone who gets offended and complains about things like this shouldn't have any public voice, as they're obviously unreasonable and prone to brazen overreaction. Just my thoughts. You realize therefore considerably when it comes to this subject, produced me for my part believe it from so many various angles. Its like women and men are not involved until it's one thing to do with Girl gaga! Your personal stuffs great. Always care for it up! Great post. I was checking constantly this weblog and I'm inspired! Very useful info specially the final part 🙂 I deal with such information much. I used to be looking for this certain info for a very lengthy time. Thank you and best of luck. It is my belief that mesothelioma is most fatal cancer. It has unusual traits. The more I look at it the greater I am confident it does not respond like a real solid flesh cancer. If mesothelioma is really a rogue viral infection, then there is the chance for developing a vaccine in addition to offering vaccination to asbestos open people who are really at high risk of developing long term asbestos connected malignancies. Thanks for giving your ideas for this important ailment.